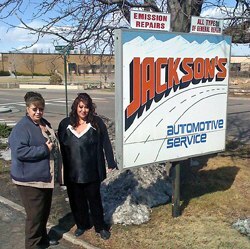 Jackson's Automotive Service uses state-of-the-art computer diagnostics to determine what may have caused your car to stop running, run rough, or make noise. We can also pinpoint fuel and wiring problems. Our ASE certified technicians will repair or replace any components necessary to get your car back on the road again. Call us at (303) 451-8256 to learn how you can save on our advanced diagnostics. Tired of failing your emission tests? Our technicians specialize in repairing emission systems. We offer a free 25-point inspection with a lube, oil, and filter change. Scheduled maintenance is recommended every 30,000 miles. Summer's coming fast, so make sure that you're not stuck in the heat with an AC recharge. We retrofit and replace all compressors. Contact our auto shop at (303) 451-8256 in Northglenn, Colorado, for extensive auto repair and maintenance services.